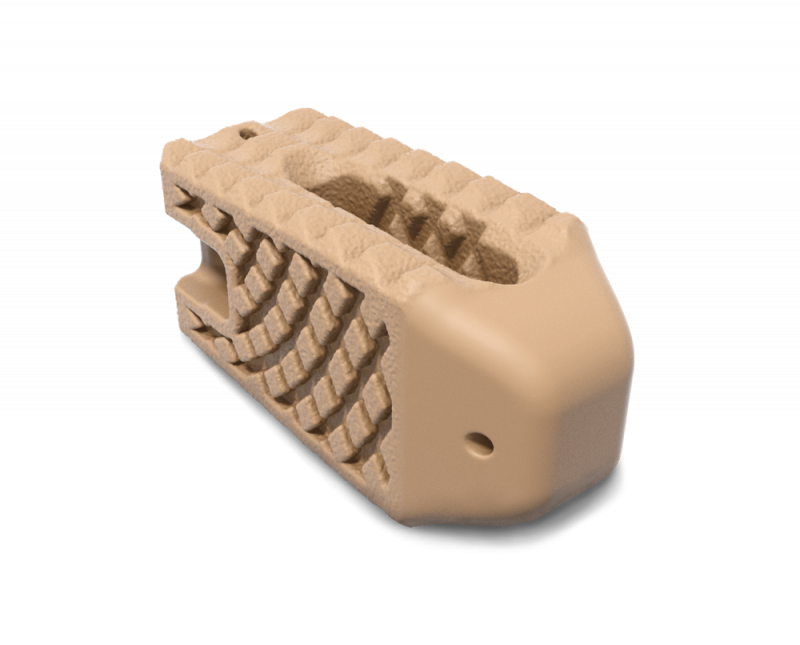 Fortilink®-TS IBF System with TETRAfuse® 3D Technology - Products - RTI Surgical Holdings, Inc. The content you are agreeing to view applies only to the United States. Outside of the U.S., we make no claims that this website or any of its content is accessible or applicable. If you do access this website from outside the U.S., you are doing so on your own initiative and are responsible for compliance with local laws. Links from this website to third-party websites are provided for your convenience only. We accept no responsibility for the content of such third-party websites. Upon accessing any third-party website from this website, you do so at your own risk. You are subject to the terms and conditions of use of such third-party websites. Adding to the new line of interbody fusion devices, Fortilink-TS IBF System with TETRAfuse 3D Technology offers patients a device designed to participate in the fusion process1,† while maintaining bone-like mechanical properties.1,†† The unique features of the 3D printed nano-rough surface have been shown to allow bone cells to attach to the implant,1 increasing the potential for fusion in posterior spine fusion surgery. Regulatory approvals vary by country. Therefore, we kindly ask you to contact the distributor in your region regarding availability of specific products, implants and / or instrumentation in your region. † Performance data from animal studies may not be representative of performance in humans. †† Lab data may not be representative of the effects with all bacteria or performance when implanted in humans. Staphyloccocus epidermidis and Pseudomonas aeruginosa were subject bacterial strains in this study. Data on file at RTI Surgical, Inc.
Wang M, Bhardwaj B, Webster T; Antibacterial properties of PEKK for orthopedic applications. Int’l Journal of Nanomedicine. 2017: 12 6471-6476. Implants are supplied sterile. Instruments are supplied nonsterile. For sterilization instructions, please reference the package insert. When Fortilink‐TS is used as lumbar interbody fusion (IBF) implants, these devices are indicated for intervertebral body fusion of the spine in skeletally mature patients with degenerative disc disease (DDD) and up to Grade 1 spondylolisthesis of the lumbar spine at one level or two contiguous levels. DDD is defined as back pain of discogenic origin with degeneration of the disc confirmed by history and radiographic studies. These IBF devices are used to facilitate interbody fusion in the lumbar spine from L1‐L2 to L5‐S1 using autogenous bone graft and/or allogenic bone graft comprised of cancellous and/or corticocancellous bone graft to facilitate fusion. The IBF devices are intended to be used with supplemental fixation cleared for the implanted level. Patients should have at least six (6) months of non‐operative treatment prior to treatment with an interbody fusion device. A medical or surgical situation that would preclude the benefit of surgery. The same medical/ surgical conditions or complications that apply to any surgical procedure may also occur during or following implantation of this device system. The surgeon is responsible for informing the patient of the potential risks associated with treatment, including complications and adverse reactions. The surgeon may need to perform additional surgery to address any complications or adverse reactions, which may or may not be device related. Potential risks identified with the use of this device, which may require additional surgery, include: implant component fracture, loss of fixation, pseudarthrosis (i.e., non‐union), fracture of the vertebrae, neurological injury, and vascular or visceral injury. The components of this device are manufactured from a radiolucent polymer and include tantalum radiographic markers. Mixing of implant components with different materials is not recommended, for metallurgical, mechanical and functional reasons. No implant system can withstand the forces of sudden dynamic loads such as falls or other accidents. Using an implant larger than the size trialed could lead to implant failure. Interbody fusion devices are designed to withstand full load‐bearing until bony union of the spinal segment(s) normally occurs. To ensure load‐bearing capability, supplemental fixation is required for use with these devices. While proper selection can help minimize risks, the size and shape of human bones present limitations on the size, shape, and strength of implants. Internal fixation devices cannot withstand activity levels equal to those placed on normal healthy bone. These implants can break when subjected to the increased loading associated with delayed union or nonunion. Typically, internal fixation devices are load‐sharing devices which hold a fracture in alignment until healing occurs. If healing is delayed, or does not occur, an implant could eventually break due to fatigue. Loads produced by weight bearing and activity levels will dictate the longevity of the implant. Correct handling of the implant is extremely important. Alterations will produce internal stresses which may lead to eventual breakage of the implant. An explanted implant should never be re‐implanted. Even though the implant appears undamaged, it may have small defects and internal stress patterns which may lead to early breakage. After implantation of an interbody fusion device and identification of the presence of fusion, only the supplemental fixation components should be removed. The Fortilink‐TS implants should not be rotated during insertion. Attempting to rotate these implants during insertion may lead to implant failure. Certain degenerative diseases or underlying physiological conditions such as diabetes or rheumatoid arthritis may alter the healing process, thereby increasing the risk of implant breakage. Patients with previous spinal surgery at the level(s) to be treated may have different clinical outcomes compared to those without a previous surgery. Preoperative planning and patient anatomy should be considered when selecting implant size and supplemental internal fixation. The physician should consider the levels of implantation, patient weight, patient activity level, and other patient conditions which may impact the performance of the device. For implant insertion, use only the instruments provided. Using other instruments to insert the implant could result in implant damage. Instruments are subject to damage during use as well as long‐term potentially damaging effects such as wear. Damage may result in significant risks to safety and/or inability to function as intended. If instruments are damaged or broken during use, metal fragments can be viewed by radiographic assessment. It is the surgeon’s responsibility to carefully consider the risks and benefits of retrieving the fragments. If the fragment is retained in the patient, it is recommended that the surgeon advise the patient of specific information regarding the fragment material, including size and location and the potential risks associated with the retained fragment. Possible general or local postoperative complications/adverse reactions that may require medical or surgical intervention (e.g., implant removal with or without re‐ instrumentation) include fracture(s) of the bone. The implants are manufactured using non‐ferromagnetic materials. These implants have not been tested for safety and compatibility in the MR environment. These implants have not been tested for heating, migration, or image artifact in the MR environment. The safety of these implants in the MR environment is unknown. Scanning a patient who has these devices may result in patient injury. It is important to read and understand the following instructions prior to clinical use. Improper preparation technique may adversely affect the success of the surgical procedure. All users are expected to read the instructions for use that accompany all devices being utilized with these implants. Do not re‐sterilize the implants in this device system. Promptly report all product defects and patient adverse events to the manufacturer (see Product Complaints section). Prior to use the surgeon must become familiar with the device system and the surgical procedure. Use surgical instrumentation, accessories, and surgical technique guide provided with this device system. The implantation of the IBF device should be performed only by experienced spinal surgeons with specific training in the use of this device because this is a technically demanding procedure presenting a risk of serious injury to the patient. The patient should understand that stress on an implant could involve more than weight bearing. In the absence of solid bony union, patient weight alone, muscular forces associated with moving, or repeated stresses of apparent relatively small magnitude, can compromise the implant. Patients should be fully informed of these risks prior to and following surgery. The surgeon should provide clear directions, warnings and must obtain verification of patient understanding for patient post‐operative compliance. Partial‐ or non‐weight bearing may be recommended or required to achieve firm bone union. Warn patient against smoking, consuming alcohol, and/or taking steroids, non‐steroidal anti‐inflammatory agents and aspirin or other drugs not prescribed by the physician. Warn patient against sudden changes in position, strenuous activity or falls that may cause additional injury. If appropriate, restrict patient’s mobility to allow bony union. If nonunion occurs, the surgeon may revise or remove the system. See product specific surgical technique manual and package insert for complete instructions and labeling limitations.